FREE Club Shops Now Available! Take the strain out of the ordering process. 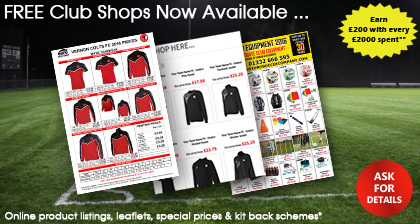 Get a Professional set up for your club, with our FREE OF CHARGE Club Shop feature. See FAQ's below for more details. What are the benefits of having a club shop? What kit back schemes are in place? Ok, but how do I monitor my spend? We do that for you. As long as the person ordering within your clubs states who they are we, then we can track all orders and provide running totals upon request. We will then provide you with updates when closing in on spend targets. Sounds great. What do I need to do to get started? Simply contact us on 01332 666 595, visit our Derby Showroom or email info@eurosoccercompany.com and one of our friendly Sales Team can assist you through the process.